Pixel 2 Bluetooth Audio Quality With Music Playback. I have made an interesting observation with regards to the audio quality with music playback using bluetooth earbuds compared to other phones that I have. Seeing as two out of those three do not have a headphone jack I decided to finally join the wireless earbud club. I went with the beatsX (audiophiles don't crucify me) as I have other Apple devices that they'll pair with nicely besides my iPhone. Anyway, while I don't claim to be an audiophile I do appreciate good quality sound and I CAN tell the difference between a decent pair of headphones VS cheap crap. What surprised me though was how much sound quality can vary between devices despite using the same headphones AND using bluetooth. I know that WIRED connections can vary in sound quality due phone's audio hardware power etc. Of my three phones, my Pixel 2 has the worst sound using Bluetooth, and surprisingly my Nokia 8 seems to put out the best sound. Surprising considering the BeatsX are an Apple owned product tailored for Apple devices. My Pixel 2 just sounds kinda muddy compared to the other two and no matter how much I try to tweak the EQ I can't get it to sound as good. Odd because using wired headphones via the dongle the Pixel 2 just pounds! Speaking of the EQ, both my Nokia 8 and Pixel 2 are running Android 8.0 but for some reason the EQ's in Google Play music are different. Before being updated to Android 8.0 my Nokia 8 had the same EQ as the top photo. Anyway nothing major, just some observations. What's your experience with the bluetooth audio quality and the Pixel 2/2XL? When you connect the headphones to the Pixel 2, go to the Settings>Bluetooth menu, tap the gear icon next to the headphones, and see if the HD Audio checkbox is on. I believe that's for AptX. Just checked. It was already toggled on. I tried it on and off and couldn't hear any difference. I looked up the specs, and you aren't using a very android friendly set of earbuds. They contain the Apple W1 chip, which improves quality and connectivity on apple devices. I don't know why they sound better on a Nokia, but from what I can find, they do not support the Bluetooth standard AptxHD codec, which greatly improves audio quality on the Pixel 2 and other devices that have it. The only thing I found for the Beatsx was bluetooth 4. I have a pair of Bowers and Wilkins PX, which support the aptxHD codec, and they sound amazing paired with my Pixel 2 XL. dmark44 and B. Diddy like this. I wonder if Bose is the same way. I have the on-ear headphones, and they sounded bad on my 2 XL, but my wired Sennheiser buds sounded better. I think manufacturers use their own set of EQ profiles. My Moto X had different EQ settings too. I kind of prefer the Moto setting I was using, but I set my 2 XL as close as I could to it. True, however before getting Oreo my Nokia just used the stock EQ just like the Pixel's. Nokia's run pretty close to stock Android so I'm surprised they bothered to tinker with that. Either way I'm not complaining! I disagree. I think the sound is pretty damn good with my jaybird x3. I also have a iphone 8 plus and its on par with that, if not better in my oppinion. I agree with you, I have the first gen Jaybirds and have no complaints about the sound over Bluetooth with my 2 XL with those or to my stereo. At least as good as my previous devices. It's not a huge difference, but it is noticeable for me. But not enough for me to not use it. Just got the Samsung IconX 2018 on Monday and so far no issues with using them on my Pixel 2XL. I don't expect mind blowing sound but they sound good for what it is. No Bluetooth cut out or anything. 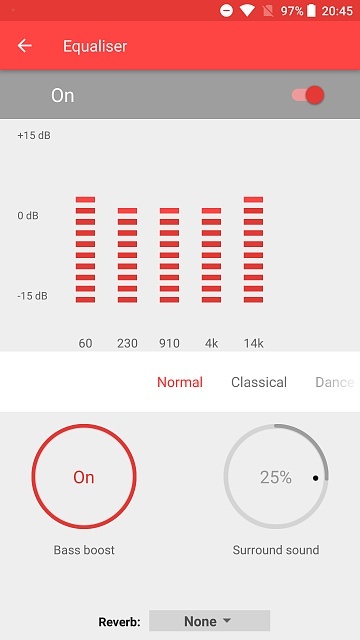 Your problem lies within the Google Play app and that equalizer. 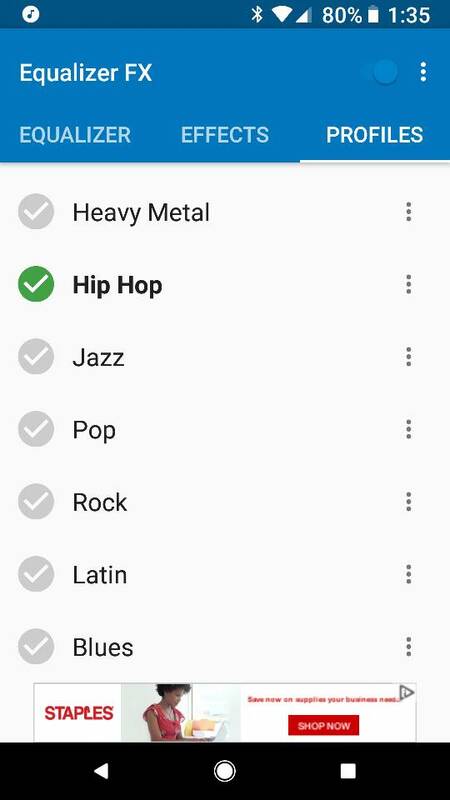 Google Play's EQ varies from manufacturer to even carriers. It's terribly implemented and never consistent. However, install Equalizer FX from the play store. It integrates within the Google Play app, and makes it sound incredibly good. Without it, Play will sound like mono garbage. Make sure to adjust the bass boost, virtualization, and loudness settings to your liking. I will give the app a try. Thanks for the info! I agree, I tried to turn on the Google play EQ, and man I turned it off quick, it is garbage. I'll give Equalizer FX a go. Equalizer FX really made all my speakers come alive. I always thought my car had terrible speakers. Years of using XM lowered expectations. Finally one day tried bluetooth with FX turned on, suddenly bass rattling thunder! Was like night and day. Also, there is a Pro version. Used to be paid, but now its free. I dont think there is a difference. I never get ads and it plays in the background. So I would download the Pro version. You can access it through same button as where Google Play equalizer button is, although I put a shortcut to app on my home screen because I adjust it all the time. Thanks for the replies so far guys. I'm going to try Equalizer FX when I get home. It didn't even dawn on me to look for a third party EQ lol. I totally agree with the OP but would add disappointing wired performance too. I am a phone junkie too and usually have 1 droid and 1 iDevice that I switch between. I recently picked up the 2Xl but have held off on selling my V30 purely because I have been very disappointed with the audio for both wired and wireless which is noticeably worse to my non-expert ears than both the iPhone X and V30. I know comparing wired vs the V30 and it’s quad DAC is not a fair fight but there is no reason why wireless cannot be as good with the same headphones. So my feeling is that the built in EQ is to blame and maybe a 3rd party replacement could improve things? 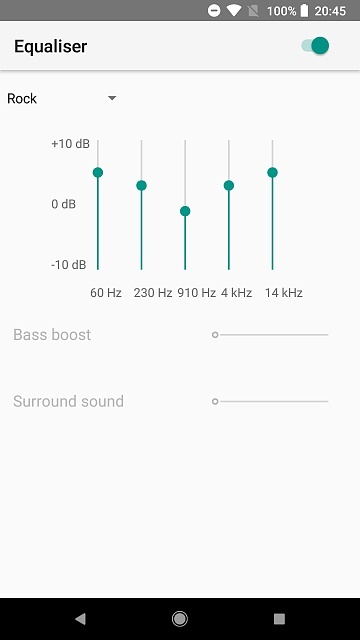 I have seen that viper for android gets a lot mentions, it is obviously not as easily installable equaliser fx from the play store but wondering if it is worth the effort? Is it as good as the hype and how easy is it to install on the P2 or 2XL? Being a phone junkie these days is hard work and is full of trade-offs! I am currently weighing up whether the 2XL was a mistake and if keeping the V30 is a better option! What happens if your main music player is Amazon Music? I don't believe the equalizer will effect output from it. To confirm I'm using Spotify. Believe the eq is global so the app you use is irrelevant? Spotify does use the stock EQ, does play music not? This is the case for wireless speakers as well. My pixel 2 sounds very "muddy" and distorted on my jbl power up. Microsoft lumia 950xl sounds fine. Also, there is a Pro version. Used to be paid, but now its free. I dont think there is a difference. Looks to me like the Pro version is still paid for https://play.google.com/store/apps/d...dnua.equalizer - I'd assume that it just removes the ads but I haven't tried it yet. Does the OtterBox Defender for this phone come with a screen protector?